All our PDFs are sent out attached to emails, the same or next working day at the latest. All our products are available in PDF format worldwide, but hard copy print versions are only available in the UK. The quiet of the gentleman’s club was shattered in an instant. “What! The blighters have done it again, confound ‘em all!” Warding, the retired general, was beside himself with outrage. “The Mahdi’s lot are having a go at Khartoum again. Something must be done about this! Queen Victoria must be informed,” he thundered! The rustling of papers indicated other members present desired the peace and solitude of this wood-panelled haven be restored at once. Meanwhile, Admiral Steele was making ready the gunboats in the Pool of London, and the Highlanders were checking their kit. They were marching once more to save Governor Gordon! This would be a day for heroes! 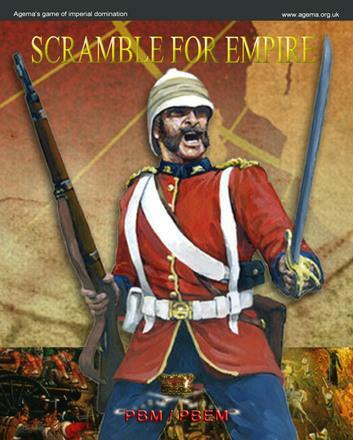 Scramble for Empire is set in the 19th century, with one game turn representing a month and players taking on a variety of roles. Typically you play as the head of a country, for example the President of France, the Kaiser, or Tsar, or the head of an expansive merchant company with global positions. Each game turn is run approximately once a month in real life, and each turn you receive details of your own position details, hopefully letters from others, the in-game newspaper, and a map (they are updated frequently). The game is not strictly historically accurate, but a pseudo-Victorian world with Steampunk elements so all sorts of oddities such as marvellous machines and the odd vampire nun are possible (without turning the game into farce, of course, the atmosphere and believability of the whole thing is marvellously Victorian!). Turns cost £10 each, or £6 each if you prefer to roleplay as a single character instead of taking on a major position. All you need is access to an email account, and a computer or suchlike in order to send and receive orders. Files are sent to you as PDFs, so anyone can open them, and your turns are sent in to us as word files (doc, docx,or rtf, for example; in fact we can cope with most text files). If you prefer, and live in the U.K., playing via the post is possible instead (a £2 surcharge applies though). The first requirement to take part is to get the rules. Nothing else needs to be done at this stage. With the rules you’ll receive a list of positions currently available, and instructions on what to do next. The rules are deliberately cheap in order to get potential players to take a look. Please note that you are not tied into anything, and you can join or leave a game of Scramble for Empire any time you like! Thanks for reading, and we hope you decide to take the plunge and join us in this epic game!